The Czur ET16 scanner can support HDMI presentation, USB capture and WiFi capture. The HDMI mode simply displays whatever is placed in its field of view. 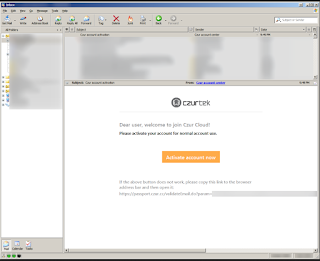 The USB capture uses a traditional Windows PC and software to capture multiple images and processes them into single documents. 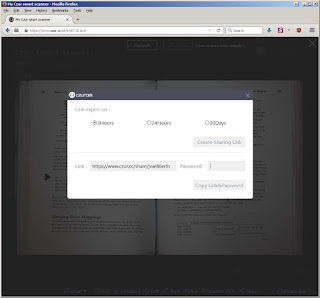 The WiFi capture uses an offsite hosting website to receive captured images and enables sharing them with other internet connected users. 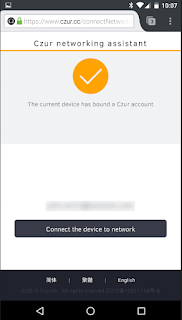 Enabling the WiFi mode is a series of steps, which must be performed in order to setup a cloud account, associate the scanner with the cloud account and then capture image scans which are automatically uploaded to the account. A cloud account user can then perform "some" postprocessing and choose to share the images with other internet connected users. Although I glanced at the one-sheet and online pdf users guide. I did not read any material in depth and proceeded in an exploratory mode.. mostly relying on my previous experience with other book and document scanning solutions. 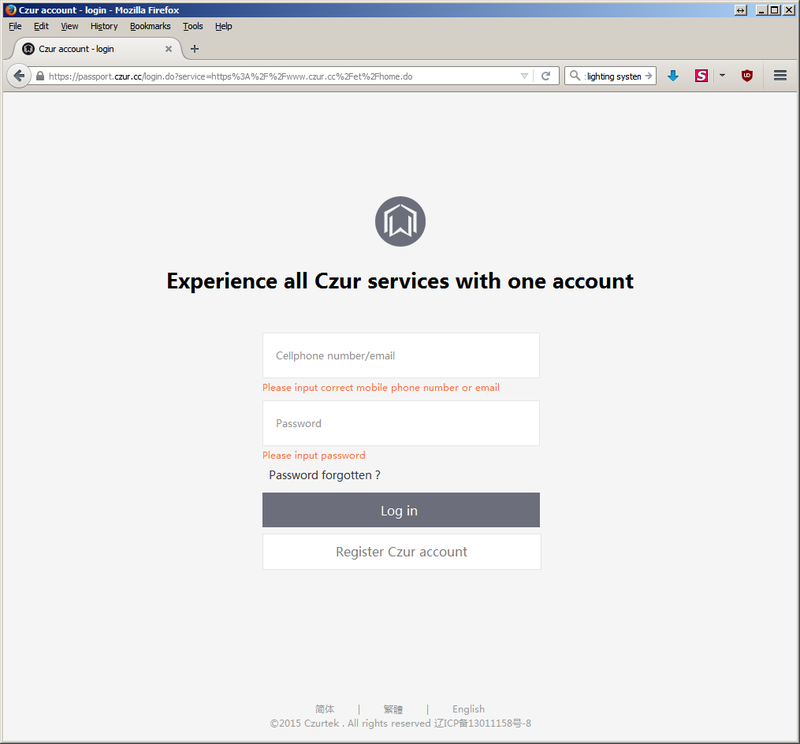 By far the most unintuitive aspect was getting the scanner associated with a Czur Services "Czur Cloud" account. My first misstep was in assuming as the [First] step I would need a mobile device in order to scan the QR code on the bottom of the scanner pedestal to retrieve a website URL to begin the process. 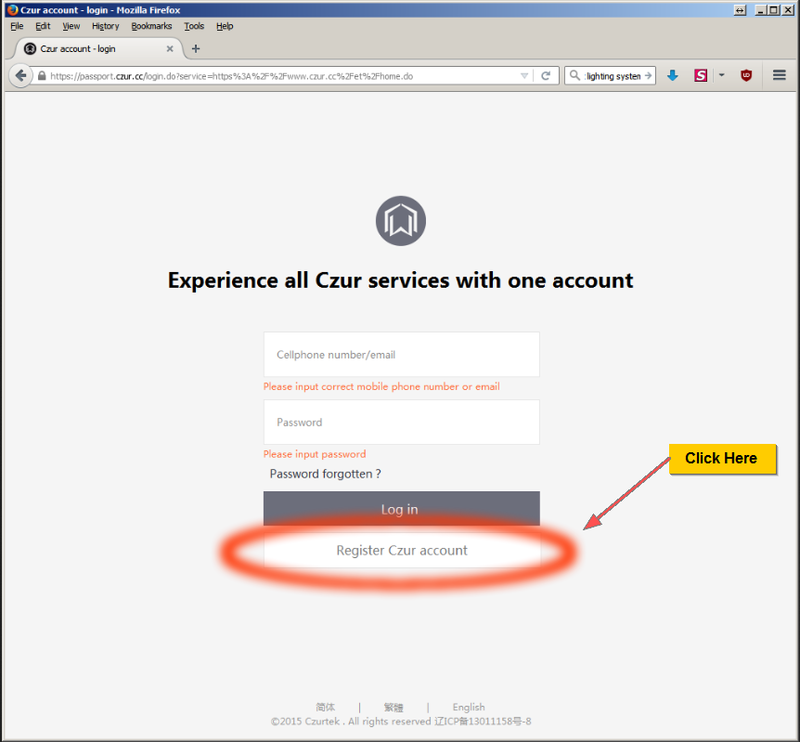 [First] step is to go to the https://www.czur.cc/ website and [Create] a new account by providing a username [phone number or email address] and password from 6-13 characters. Normally I would encourage a long and complex password, but in this case since I would be typing it into the mobile device I chose a simple and short password. 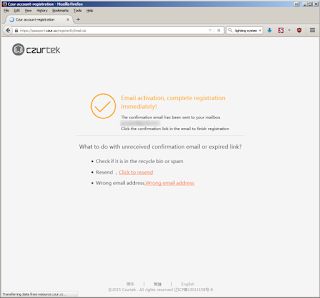 [Second] step is to "Activate" the account, a confirmation email is automatically sent to the recipient email address which has a link to confirm the account request. This took about 2 minutes from the time I submitted the request to the time it appeared in my Inbox junk folder. I use Outlook.com and for some reason they automatically categorize it as junk mail without any further notification. 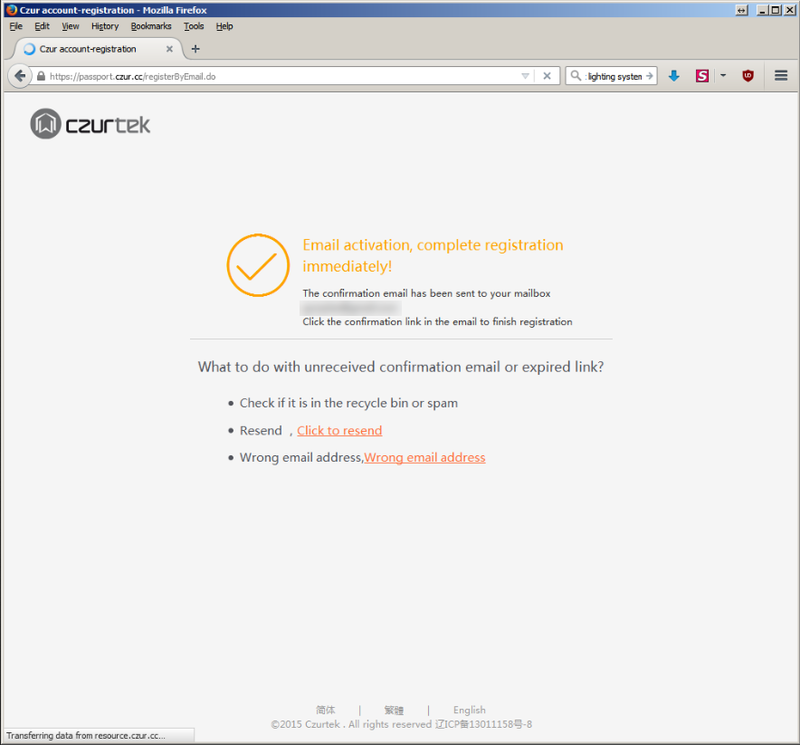 So I restored it to my normal Inbox and completed the confirmation by clicking the link in the email which told me I had succeeded in activating the new account. 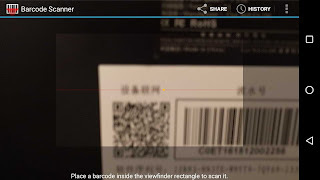 [Third] step is to use a mobile device and a barcode app to "Scan the QR" code on the bottom of the pedestal of the Czur Scanner. 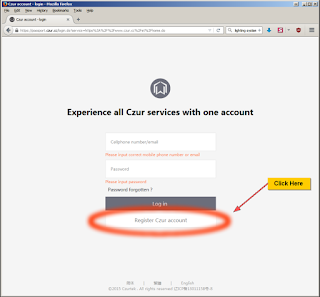 It immediately recognizes a complex URL path and asked for permission to continue by opening the URL in a browser. At first I tried Firefox for Android but this proved problematic. Many browsers seem to be wary of allowing sound files to be played when opening a URL, and its a non-trivial task to enable a properly formed URL that works even when a browser user has been prompted in how to play an audio file embedded in a webpage. Therefore I copied and pasted the URL from Firefox browser on Android to Chrome on Android.. and it still did not function properly.. but I'm getting a little ahead of myself here. The type of WiFi security expected is not clearly stated, be it WPA, WPA2, WEP or Open. Generally consumer grade wireless access point/routers deploy a kind of WPA but not WPA2 and WEP is very rare these days, Open is possible but then you rarely need a password. If you have a captive portal type situation where a WiFi user is challenged with a custom logon prompt on first access to the internet with a brower.. this would probably not work. In any event, the website prompting for SSID and password, accepted those and indicated a custom audio file will be created with that information and presents a button that says "flashing" but actually intends to mean I think "begin the process of configuring your scanner" -- pressing the online button produces a dynamic strobe/rotisserie indicating a "sound file" was being created.. then produces a new page with directions on how to place the scanner into [reset or "configuration" mode] and a button on the mobile device to [Play] the sound file. Figure 4. When the Scanner begins to Flash Green & Blue "Press Play >"
The speakers of the mobile device must be held close to the microphone in the "nose" of the scanner. 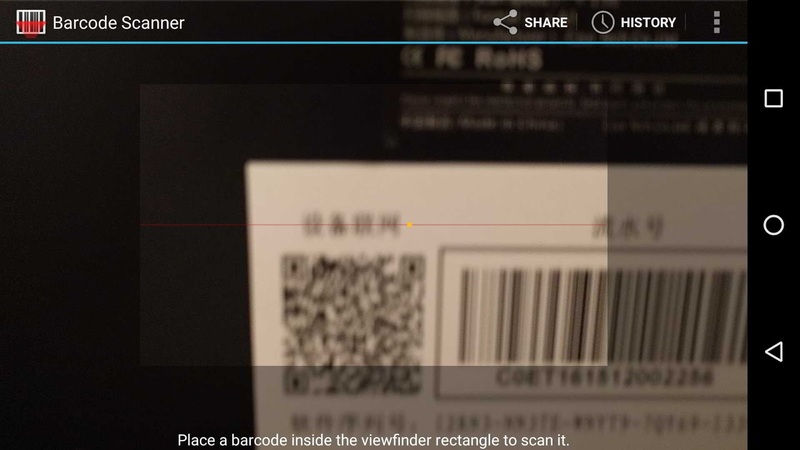 It appears as a simple small pin hole in the surface of the plastic on the front of the scan head. 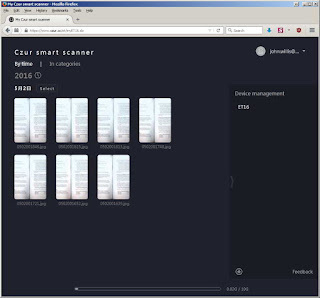 The first time I attempted to do this with Firefox for Android and then Chrome for Android no sound was produced, the web site indicated it was attempting to configure the scanner, then timed out and asked whether the scanner WiFi light was Green or had gone out. Green would mean it had succeeded, no light would mean it had failed to configure. After a few moments of trial and error, in Chrome, I used the triple elipse or three vertical dots in the Chrome address bar to pull up extended options for the browser treatment of this webpage. 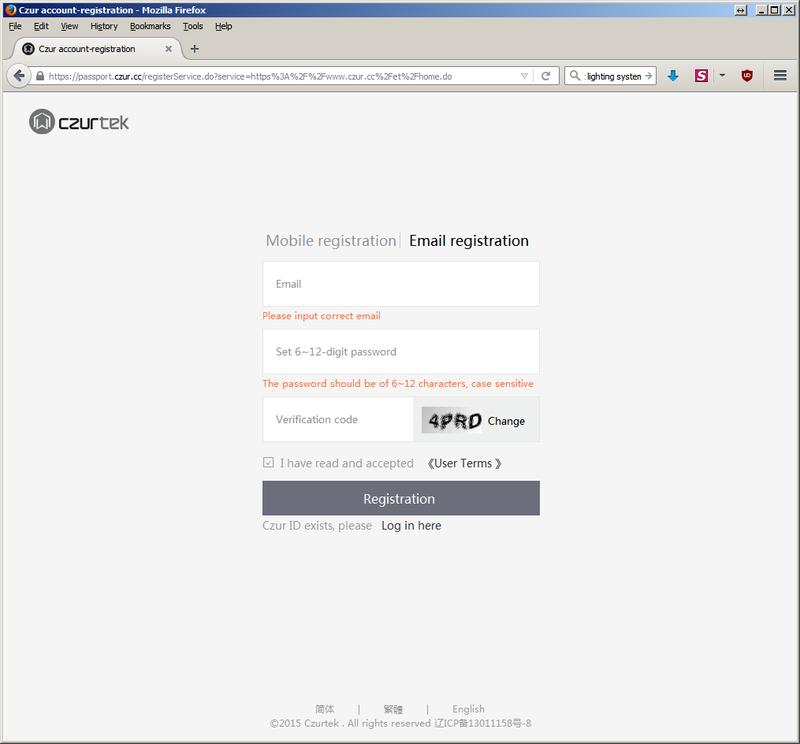 I checked the box for [Desktop version] and it reloaded the page, and I tried again. This time the sound file played a musical number through the mobile devices speakers (i was using a Nexus 5X). But the first attempt failed. Repositioning my mobile speakers directly in front of the nose of the scanner, the second attempt failed. The [Third] attempt succeeded, if by any chance I had entered in the wrong credentials for the WiFi I can imagine this process would take longer and be much more frustrating. But I had entered the [correct] and [accurate] Cloud account credentials and WiFi SSID and password.. so the failures could only be attributed to other variables... they were entered into the webpage for generating the sound file only once, subsequent trials were re-created by pressing back and forward in the browser to restart the sound file creation process without re-entering any of the credentials. Using a web based "on the fly" generated audio file for configuring a hardware device is novel. But there are just too many variables in the process and possible human error that could make the process difficult, expecially for first time users. I then repeated the process with an iPad2 and found the same URL links would also produce an audio file and played it back through the iPad2 speakers.. so it is device agnostic.. and possibly could be made to work with a notebook computer, even a desktop.. but I wouldn't recommend it.. for one thing you need a barcode scanner app for the computing device, these are ubiquitous on aPhones or iPhones. And you need to be able to position the output of the speaker directly in front of the "nose" of the Czur scanner.. something that might be more difficult with normal computer speakers. Its been suggested by some people to support a [Fourth] option for Capture, plug in a USB storage device to the PC usb port.. its the wrong USB connector type "B", but an adapter could turn it into a normal USB storage type "A" connector [ B/A USB Adaptor ] then let the user offer up a USB SSD storage device to offload the scanned images with no WiFi and no computer. would be awesome, a complete standalone scanning option. I'm highly in favor of that option! Even easier would be to [buffer] all of the scanned images in cache, until a USB storage device was plugged into the hand or foot pedal trigger port, and offload them enmasse. The firmware in the device would probably be able to distinguish between a USB storage device and a USB HID device and perform accordingly. -- in this way Mac and Linux would be able to access the images immediately once the USB storage was moved from scanner USB port to Mac or Linux USB port. Honestly though.. while Windows automatically associating the [wrong] PnP driver when first connecting a device [before] installing the device drivers is [annoying].. it is.. far more familar a problem. Windows PC USB capture remains my preferred mode of scanning at this time. Once the device was configured, the scanners WiFi icon went solid green.. which I assume means it could connect to the WiFi gateway and through it the Internet. This had another effect in that the webpage on the mobile device, that was indicating it was trying to configure the scanner by playing the audio file. Then it transitioned to another web page indicating it had noticed the scanner had been successfully associated with the cloud account. I would assume the scanner updated status with the services on the cloud servers and that triggered the status change and then updated the webpage the mobile device was viewing. note: a user should not turn off the scanner while it is still uploading to the cloud, or they may loose data. -- I noticed a few sponsors of the project complained of torn or "incomplete" scan images, and this mode of failure [immediately] came to my mind, if they spend a lot of time scanning and manage to [buffer] some of the scans into cached memory.. then shut the scanner "off" while its still uploading to the cloud.. The WiFi indicator would change to blue while it was uploading to the cloud and return to green when done. I assume green simply means it can contact the cloud services account. The upload speed was fair and not that different from the upload or download speeds for USB Capture. [ capture speed ] the interval between sequential image scans (or captures) could be likened to the "burst speed" of a rapid fire DSLR, and it is quite good for this scanner.. I'd estimate 1-2 seconds between snaps, you can watch me in one of the videos and while I can overrun the sequential captured images in the cache with the switch at the base of the scanner or the USB hand switch and a twitchy trigger finger.. I "could not" with the USB foot pedal.. and that is not a deficiency of the foot pedal. Its simply my reflexes moving a foot and large calf muscle were not quite as fast as the small muscle and short lever in my finger. -- if an SDK or the usb communications to trigger a snap can be worked out it might be maximized slightly further.. the "snap speed" would ultimately be a function of the software at that point.. perhaps limited by a different trigger.. "EEG perhaps?" [offload speed] is the interval between downloading fully cached image scans (or captures) this is limited by the speed of the medium the bits and bytes have to cross to their ultimate destination. The USB 2.0 spec says this is 450 Mb/s at most, and in reality it is somewhat less.. and will depend on how many devices are sharing the USB bus port, how busy the PC is with other tasks it is doing, and what the user may be attempting to do while an image is transiting the path from scanner to PC. 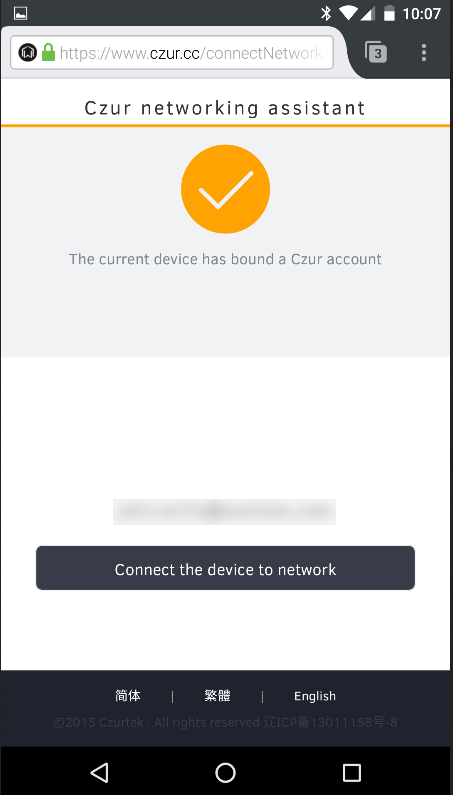 In the case of Czur Cloud its further complicated by TransPacific or TransAtlantic or Trans(intercontential) oceanic cable media, Internet traffic Weather and how busy the servers are at Czur HQ. The really [Good] news is the Czur scanner has up to 1 Gigabyte of storage onboard which is about 1000 Megabytes and each scan is on the order of 3 to 4 Megabytes.. while its possible to imagine a book scan user zoning out in [Terminator] mode and rapidly flipping pages like a madman.. they would have to have the sustained endurance to cache around 250 pages before they would overflow the possible caching onboard the scanner. There is also an apparently "finite" recoil time imposed by the switch or the software in the scanner that limits the upper capture speed to something less than 2 seconds. So if you do "the numbers" worst case they would have to be flipping pages one per second for almost five minutes to overrun the buffer... that's a long time continuously flipping and without making a mistake. Reality is they will probably have to take a half second or more to position, and or correct for sticky pages, or making sure to separate pages while turning. At one page per second their fingers and the page corners would look like a blurr, or the insides of a blender. -- but that's only if their goal is to "be faster than the scanners ability to keep up with their performance. Sounds like it should be an Olympic sport. 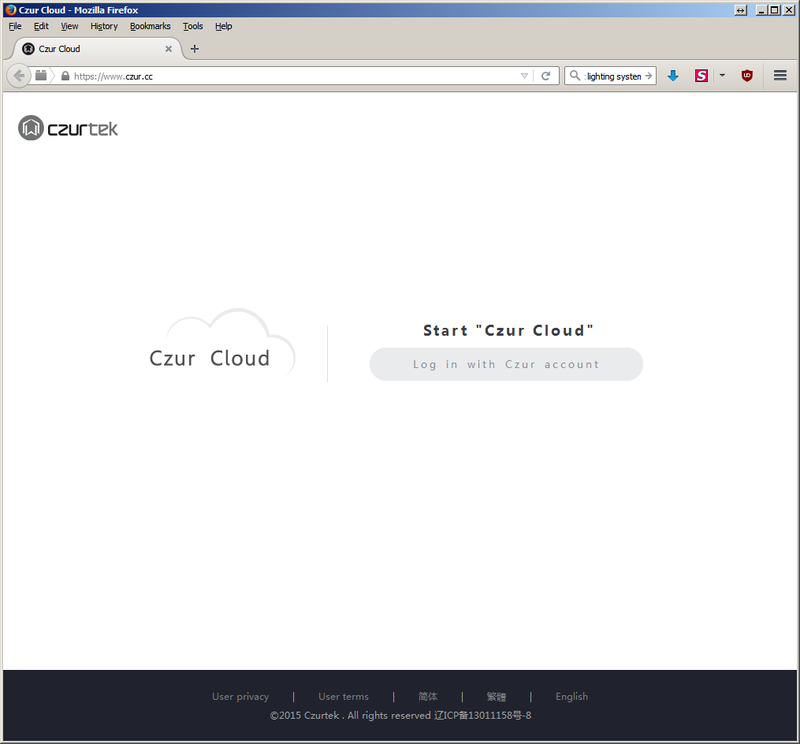 <sarcasm>"
I then logged into my czur service cloud services account and found I could browse the images and to some degree correct or manipulate them. However there was far less functionality that what was available in the USB Capture software for Windows 7, 10. I could rotate left and right, crop, and change the algorithms applied to the image, reverting to a type of unprocessed mode. 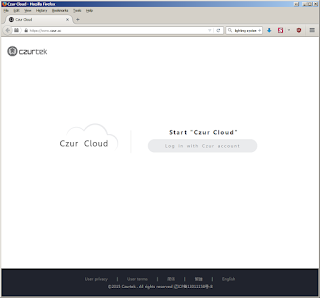 I could possibly place them into folders to organize them and then share them with other internet connected users.. but that pretty much concluded my explorations and interest in cloud services. The storage counter on the account seemed to indicate 10 GB of storage space was available, and the uploaded images had taken a portion of that. I am reticent to use cloud services in anything less than a limited collaborative engagement and judging from the lack of success of many cloud companies offering online storage.. I certainly would not trust them for archival storage. As an option for Mac or Linux users, this is definitely a method of obtaining 2D and 3D curve corrected images. However various realities of cloud usage may preclude the use of the method in large volume scanning situations. A Windows pc would appear to be necessary to successfully use the scanner at the present time however it doesn't have to be a powerful pc. I have not looked at the virtual machine or bootcamp options. But various virtual machine technologies are known for their USB support; Hyper-V basically has limited to no USB pass-through support, VMware has good USB2 support, VirtualBox has good USB2, USB3 is such a different kernel supported feature that even the virtual machine guest operating system may have trouble supporting it.. USB3.0 was not natively supported in Windows until version 8 and then the virtual machine hypervisor authors only implemented a shell of a pass-through with terrible performance. This has complicated implications even for the vm hosts.. as many new systems have very few if any pure USB2.0 ports.. but are in fact usually USB3.0 ports run in some sort of compatiblity mode. Other considerations are [Lighting] -- while the provided field of view is well illuminated by the side lit LED arrays, there is a distinctive "Temperature" to them which appears somewhat on the high side. -- A nice option is to turn them off and use "ambient" lighting. This seems to have been a consideration in the design as one of the toggled illumination modes is to simply turn the LED arrays off. In theatre and lighting for various productions a "key light", "fill light" and "back light" are used to create the color and desired lighting of a scene. CREE LED bulbs for simple desk lamps and swivel lamps are available (in varing Temperatures) widely and conveniently from IKEA which could serve multiple purposes, including personally tailored scan media lighting. 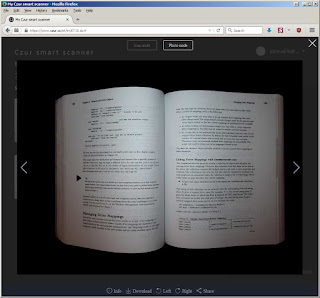 The scanner has the potential to be used as a complete 3D scanning platform for obtaining three dimensional scans of objects. The laser guidlines provide a reference set of points and curves which can be used to decontruct or reconstruct the surfaces being scanned. The process is simply the [inverse] of "flattening" rather its "measuring" the difference between a monochromatic light source on a surface and the chromatic response of a surface and interpolating the distance. 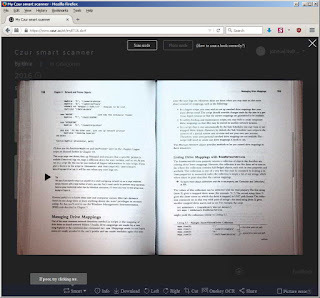 A very similar process to flattening image scans.